There is evidence that primitive versions of surgical tools such as scopes, trocars and scalpels were in use prior to the discovery of metal, with examples of instruments formed from stone, wood, reeds, bone fragments and other organic materials on record. However, it is thought that the first hinged instruments from which modern laparoscopic graspers are descended were not developed until after the discovery of copper and bronze, as organic materials would not have been suitable. One of the earliest examples of surgical forceps, consisting of a pair of bronze limbs bound together by a leather thong to form a pivot, was found in Greece, dated circa 1450-1400 BC. Archaeological evidence from the ruins of Pompeii suggests that Roman surgeons were using pivoted bronze instruments by 79 AD, and by the time of Arabian surgeon and encyclopaedist Albucasis (936-1013), such tools had evolved into a number of different types designed for specific applications. Modern instruments are typically manufactured from surgical grade stainless steel, and may also incorporate other materials including titanium, tungsten carbide and various plastics. 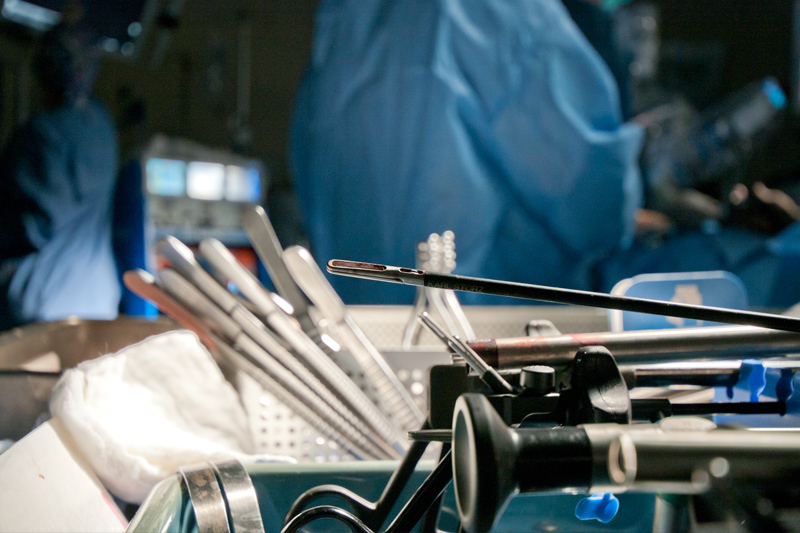 How are Laparoscopic Graspers Different than open instruments? Laparoscopic bowel graspers are one of a range of standardised laparoscopic tools that differ from their conventional surgical counterparts in that they have an extended shaft or stylus in order that they can be manoeuvred through incisions that are usually no larger than 5mm during minimally invasive procedures. A laparoscopic tray with a fenestrated bowel grasper is in the foreground while a traditional open surgical tray lies in the background with a series of different grasping forceps. The most obvious difference between the two different instrument designs lies in the long thin shaft that is mandated for laparoscopic instrumentation. Instruments are available with various form factors, and can be reusable or disposable. 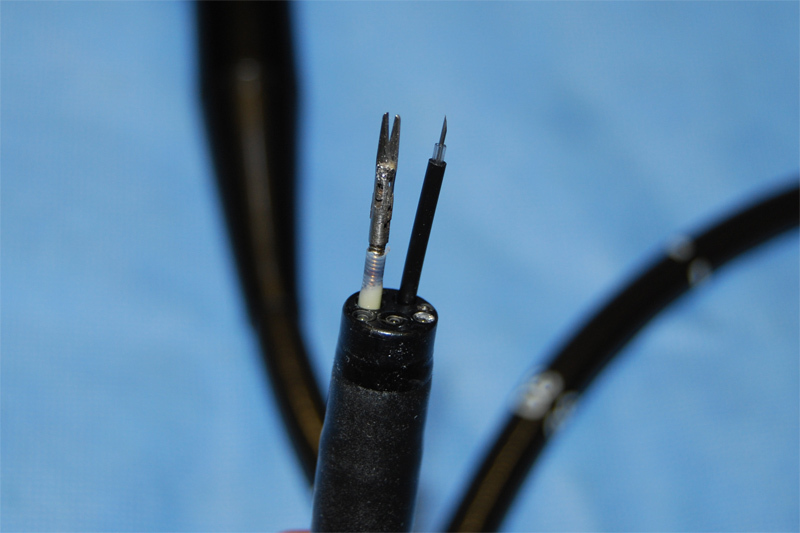 Typically comprising a handle, insulated shaft, and an insert that forms the tip, some versions also include cautery posts for attachment to monopolar electrosurgical cables. Such devices are precision engineered, yet contain few moving parts as they are designed for use within highly constrained spaces around delicate internal organs. Models with diameters within the range 1.8mm to 12 mm are available, but most instruments are designed for use within 5mm or 10mm openings. 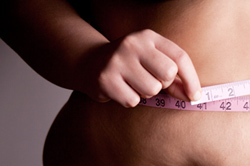 Lengths of approximately 30 to 35 cm are typical for many adult procedures, but longer or shorter instruments may be required under certain circumstances. 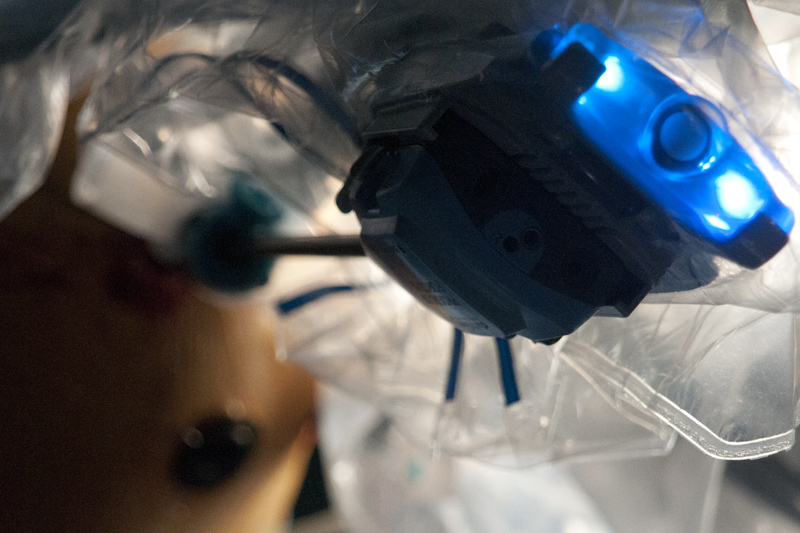 What is the design of a typical laparoscopic grasper? The external surface of the instrument shaft is coated with an electrically insulating layer of plastic or silicone, to alleviate the risk of electrical burns due to insulation failure or capacitive coupling during the application of electrosurgical energy. The handle of the instrument may sit in line with the shaft, and articulating or flexible types are also available, but most commonly it is located in a fixed perpendicular position relative to the shaft. The tips of the grasping instruments can be specialized as to limit the amount of trauma that is applied with each movement. Transmission of grip strength and pressure per unit area can be altered by changing the design of this part of the instrument from smooth to a serrated alligator like shape. Single-use graspers are typically supplied with a ring handle, with an upper loop for the thumb and lower loop for one or more fingers. Handles of this type may be best suited to applications where the precision afforded by a pincer grip is an important factor, whereas handles that allow the greater force of a palm grip to be used can be more appropriate for tasks requiring power over precision. 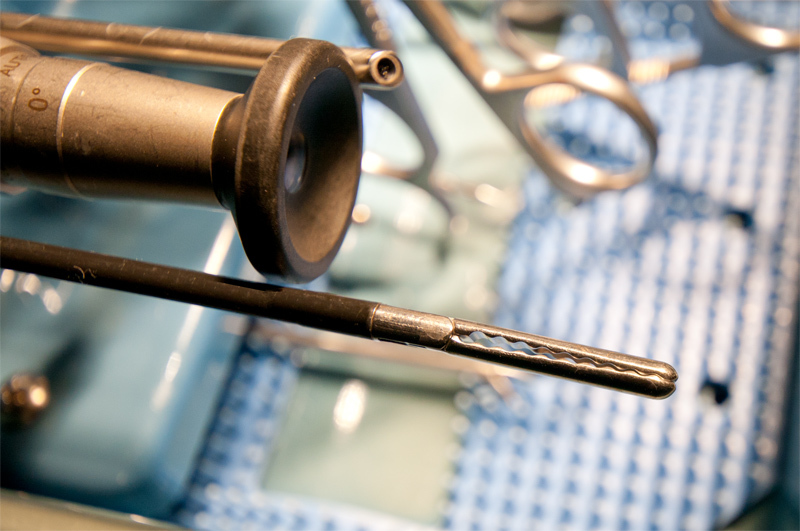 However, it is a matter of personal preference, and reusable instruments are often modular, such that the surgeon can use their preferred handle type with a range of different tips as required. In addition to ring handles, various other designs are available, including spring-loaded shank handles with a pistol-like operation, as well as a range of multifunctional handles. What are some special design features? In situations where the position of the grasped tissue must be maintained for prolonged periods, the ability to lock off the jaws of the instrument can help reduce hand fatigue, hence most bowel graspers are equipped with some form of locking mechanism, usually operated by means of a lever located in the handle of the instrument. Ratchet mechanisms, allowing the jaws to be locked in a range of different positions, depending on the amount of pressure required, are most common, although other designs are available. Some instrument designs permit 360o rotation of the grasping tip via a wheel or knob located on the handle. This is usually positioned on the top of the instrument where the handle joins the shaft, such that it can be manipulated by the thumb. A flush port for accessible cleaning of the internal bore of the shaft may also be incorporated into the top of the handle. Bowel tissue is considered to be among the most delicate in the human body, so it is essential that the grasping tip is able to offer a safe, secure grip, without exerting excessive pressure. Various types of jaw are available, including straight or flared, traumatic or atraumatic, single or dual-action, and fenestrated or solid. Bowel graspers should always be of atraumatic design, i.e. with dull rather than pointed ends, designed to exert a secure yet gentle grip on the bowel tissue. Single-action types, with one fixed and one movable jaw, can deliver greater pressure than double-action jaws, but offer a smaller opening in which to grasp the tissue. Unfenestrated designs have solid jaws, relying on friction to hold the tissue in place. Fenestrated designs incorporate an open area or window into one or both jaws, making them lighter, and theoretically offering a safer grip than friction alone by enclosing a portion of tissue within the window. In both cases, larger jaws offer greater friction, and therefore a better grip. The inner surfaces of the jaws may be profiled with waves, teeth, protruding hemispheres or cross-serrated ribbing, in order to further enhance grip characteristics. Cross-serrated ribbing offers the advantage of working in a range of planes, whereas a waved profile is effective only in the plane perpendicular to the direction of the waves. How can laparoscopic graspers cause damage? Wielding bowel graspers requires practice and skill because the tips of the graspers are small and pressure at the tips is magnified; too much pressure can lead to tissue damage and too little pressure can cause the tissue to slip out of grasp. Minimally invasive techniques can deprive surgeons of the tactile feedback, depth perception and hand-eye co-ordination available to them during open procedures, making it much more difficult to judge how much force to apply. Grasping tissue requires an understanding of the force being applied per unit area. There are many different cues that the surgeon uses in order to understand how tight the instrument tip is gripping the tissue. Haptics refers to the sense of touch and with robotic systems applies to tactile feedback technology. The robot currently has limited haptic feedback therefore the surgeon must rely on visual cues such as tissue deformation and stretch. This is even more of an issue when graspers are used in robotic surgery, or during virtual reality laparoscopic training. A good force feedback mechanism is therefore essential. In manual procedures this can take the form of a mechanical arrangement of tensioned cables and pulleys running between the jaws of the instrument and the handle. Virtual reality or robotic systems may incorporate haptic technology, where force sensors integrated into the instrument tip can be used to provide the surgeon with tactile feedback via various means including vibrating pads located in the handle, or a cylinder grip that rotates to indicate that more pressure is required. Natural Orifice Transluminal Endoscopic Surgery (NOTES) is slowly entering the medical armamentarium as a viable alternative for some procedures. Maneuvering tissue is a limitation of current technology. While grasping tips can exert enough force in a particular area to hold on to a piece of tissue, it is difficult to maneuver that tissue in a precise manner and with minimal trauma.